Diesel fuel is a liquid product which is used as fuel in the diesel engine. It is received by oil distillation from kerosene and gas-oil fractions. It represents quite viscous and difficult evaporated combustible liquid. Generally it consists of carbons, some percentage of hydrogen, oxygen, sulfur and nitrogen. Such type of fuels is intended for high-speed diesel and gas-turbine engines of land and ship equipment. Ignition of fuels in diesel engines takes a place at fuel injection in the air, which is heated to high temperature at the compression by the piston. Diesel engines belong to the most economic thermal engines; they have less fuel consumption and higher efficiency, than petrol engines. Every year the world market consumes million tons of diesel fuel. Diesel fuel is especially popular in Western Europe – after filling with qualitative diesel fuel, the diesel engine is really capable to operate more time without overhaul, than the petrol engine. Imagine for a second what is the benefit? Diesel engine becomes more popular for installation to modern cars. Certainly, supply system of the diesel engine much more difficult and differs from system of the petrol engine. As diesel fuel in the combustion chamber moves under big pressure, with small quantity isn’t of it, and all power supply circuit make engine more expensive. Besides, the diesel engine for the purpose of preservation manufacture stronger than petrol engine because of safety. Nevertheless, the main advantage of the diesel, especially important in the conditions of an economic crisis is diesel economy efficiency. The efficiency of diesel engine reaches 36% and even above while at efficiency gasoline doesn’t reach 25%. In addition, the diesel engine has higher torque. It helps to move with city jams and in jams on the route on single turns. Also for better diesel economy it is possible to add biodiesel fuel in certain proportions. The biofuel is one of the most promising substitutes of traditional diesel fuel. As alternative fuel, the biodiesel represents the diesel oil received from vegetable raw materials. As these raw materials can be grown up, instead got it from the ground, use of the biodiesel promises considerable benefits. The advanced car manufactures recommend B5 fuel use (the maintenance of 5% of the biodiesel) in diesel engines automobile and trucks of own production. And use of a mix of B20 (20% of the biodiesel) is slowed down due to the lack of standards for universal biodiesel fuel. Such mixes can be received by mixing of diesel fuel with biodiesel using blending systems. 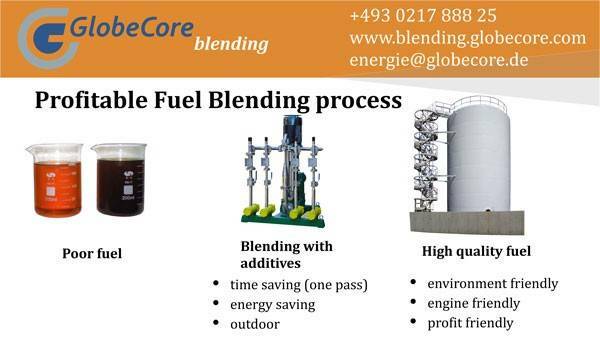 Advanced technologies in designs of diesel engines with difficult systems of purification of exhaust gases demand universal standards if producers need to use diesel mixes with the high content of the biodiesel for diesel economy.GlobeCore blending company is intended in production of biofuels mixing systems. Our installations are used in more than 70 countries of the world carry out the following processes: production of light and dark oil products. Production on the basis of crude oil products (high-quality gasolines AI-92, AI-95, AI-95, Bio-100, biogasolines, the eurodiesel, the eurofuel, corresponding to European standards to Euro-4, Euro-5, light heating fuel light, dark heating fuel, fuel oil corresponding to European standards to Euro-4), varnish paint, food industry, energy saving, transportation of oil products, biodiesel plants. Our USB installations are delivered worldwide, today are the more than 53 countries, hundreds objects where work our installations, these installations can work in any climatic zones and under any climatic conditions.